for there is my delight. 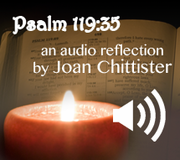 This downloadable audio file is a reflection by Sister Joan on a psalm 119 verse 35. Beautifully interwoven with instrumental music, Joan reflects on the verse�s meaning and asks probing questions about it�s message for our lives. This 5 minute meditation makes it possible for you pray this psalm on your way to work, in your prayer space, before going to sleep, waiting at the doctor�s office�anywhere, really! This psalm meditation was originally included in an eCourse at Monasteries of the Heart.